With almost no prep for a bubbly cheese topping - these tomatoes are real gems. 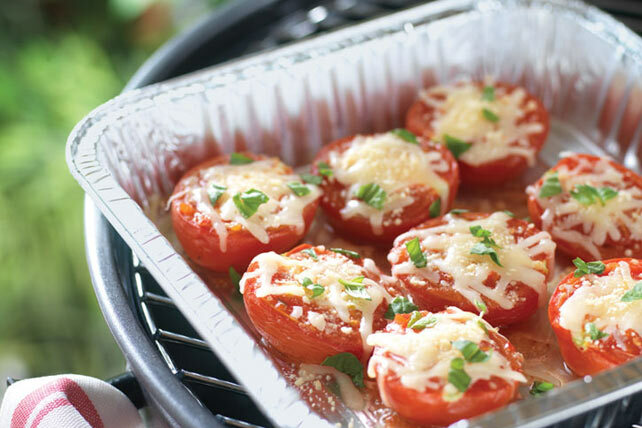 Place tomatoes, cut sides up, in 8-inch square foil pan sprayed with cooking spray. Drizzle with dressing; top with cheeses. Place pan on barbecue grate. Grill 10 to 12 min. or until mozzarella is melted and tomatoes are heated through. Substitute fresh parsley or chives for the basil. This delicious grilled vegetable side can fit into a healthy eating plan.